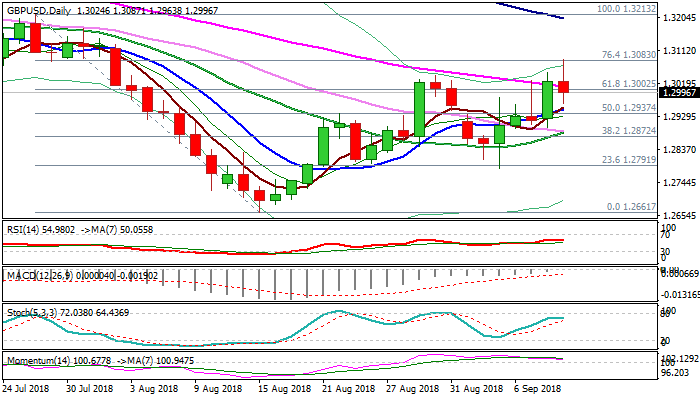 Cable entered American session on Tuesday in red after full figure dip from new five week high at 1.3087, caused by badly executed sell order, prompted investors to exit long positions. The pound was hit further by announcement that BoE Governor Carney will extend his term in the central bank for seven months. The pair extended weakness to new daily low at 1.2963 on soured near-term sentiment, despite better than expected UK jobs data (avg. earnings rose 2.6% in July vs 2.4% f/c while jobless claims fell below expectations in Aug (8.7K vs 10.0K f/c). Fresh weakness was also helped by renewed risk aversion on rising concerns about US-China trade conflict, as China responded to the recent action of the United States. The pair returned below broken falling 55SMA, with close below to neutralize initial positive signal and risk deeper pullback. South-heading 14-d momentum created bear-cross and moves towards negative territory, supporting the notion, as falling daily cloud is thickening and continues to weigh.